101 Recipes You Can’t Live Without is a cookbook created by Lori Powell, the food director of Prevention magazine. Most healthy recipe books concentrate on cutting back on fat and calories. However unfortunately this can lead to a loss of flavor as well. The recipes in this book are designed so every meal is focused on nutrient dense foods. This results in tasty dishes composed of fresh, whole foods that will enhance your health, prevent disease and shrink your waistline. Lori Powell explains that it is best to get our nutrition from food instead of relying on vitamin pills. There is an intricate blend of nutrients in foods that work to enhance your health in a way that is far superior to supplements. Prevention has identified the nutrients that have the greatest ability to promote optimal health. These compounds have been demonstrated by scientific research to protect against conditions such as heart disease and diabetes. These nutrients also support you in your goal to achieve your ideal weight. Readers are advised how much of each nutrient to consume each day. Also provided is a list of recipes that have high levels of a particular nutrient. Instead of popping a pill you can get your daily needs for vitamin C with Asian Chicken Salad in Lettuce Cups with Peanut Sauce. More than a third of your daily calcium requirement can be obtained by starting your day with Creamy Steel-Cut Oats with Dried Cranberries and Pistachios. You can get three days supply vitamin D from Roasted Cedar-Plank Salmon with Mustard-Maple Glaze. The secret to creating nutritious recipes is based on smart substitutions in traditional dishes and an emphasis on superfoods. However, you won’t by eating strange foods that you’re not familiar with. All of the recipes in this book are based on ingredients you can find in your local grocery store. Blueberries, strawberries, pears, kiwi, dates, red cabbage, kale, carrots, broccoli, spinach, beets, Brussels sprouts, winter squash, tofu, endamame, black beans, lentils, yogurt, eggs, grass-fed beef, oysters, salmon, sardines, clams, pumpkin seeds, walnuts, almonds. 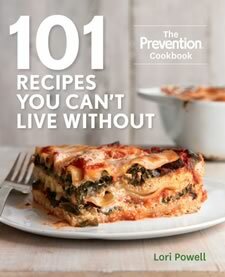 101 Recipes You Can’t Live Without: The Prevention Cookbook retails at $24.99. Encourages getting your nutrition from food rather than supplements. Recipes classified according to what nutrients they are highest in. Calorie and other nutrition information is provided for every recipe. Includes a 7-day meal plan. Offers suggestions for simple between-meal snacks. Most people won’t have time to prepare the recipes for every meal of the day. Will be necessary to adhere to the recommended serving sizes to control calorie intake. This book provides 101 nutrient dense recipes that feature 13 health-promoting nutrients. It will appeal to those who enjoy cooking and learning about how our food choices affect health. Because the meals are calorie-controlled you will probably lose weight by using the recipes in this book. However, it is necessary to be aware of portion sizes and engage in physical exercise to achieve ideal results. Wang, H., Cao, G., & Prior, R. L. (1997). Oxygen radical absorbing capacity of anthocyanins. Journal of Agricultural and Food Chemistry, 45(2), 304-309. Ziegler, R. G. (1989). A review of epidemiologic evidence that carotenoids reduce the risk of cancer. The Journal of nutrition, 119(1), 116-122. Wang, T. J., Pencina, M. J., Booth, S. L., Jacques, P. F., Ingelsson, E., Lanier, K., … & Vasan, R. S. (2008). Vitamin D deficiency and risk of cardiovascular disease. Circulation, 117(4), 503-511.